It’s peak wedding season which makes it a really busy time for me, so it’s been a LONG time since I blogged, but having tried two new products this week it seemed like the opportune time to get typing. So here’s my review of two lovely Bourjous products – their Happy Light foundation and Mega Liner. 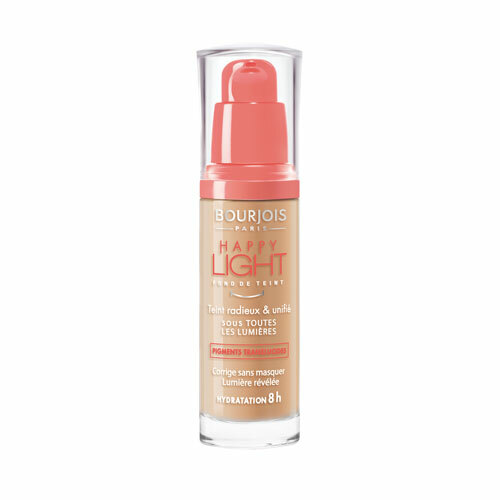 I love Bourjois foundations and this one definitely didn’t disappoint. The liquid formula is light and smooth, making it very easy to apply either with a brush or fingers. I apply using a Real Techniques face brush and buff with a stippling brush to get the best coverage. I think the formula would be great for dry skin, as it would definitely hydrate it and provide a dewy glow, or combination skin (like mine, I have an oily T-zone). In my opinion, I don’t think those with really oily skin would find this to be their perfect product – I just don’t think the formula will mattify your skin or give you the coverage or last you’d be looking for – but you’d need to try it yourself to see and perhaps with the right oil free primer and finishing powder it could work for you. For more mature skins, I think this would be the perfect foundation – and would even mix well with a moisturiser if you wanted a light coverage. The coverage is medium – it’s definitely more than a light foundation or a BB cream/tinted moisturiser, but I wouldn’t call this full coverage. You can definitely build the coverage though – and if you want to do this, I’d recommend applying a layer, doing your other makeup (eyeshadow, liner etc), then applying another layer on top & blending together. Does it last? Well I put my makeup on about 7 in the morning, go on busy commuter trains and spend my day in a hot studio and when I wore it last week it still looked good in the evening. That said I wore it with a primer (Mac) and finished it in my T-zone with a loose powder (Clinique). I should also mention that this does not have SPF (hooray). I don’t like SPF in a foundation because if you’re enjoying life – parties, nights out, celebrations, and get your photo taken, SPF is not camera flash friendly and you will look a bit cakey & ghostly. That said, this is not a product you want to be wearing on holiday or in the sunshine (go for something with SPF like a BB or Tinted Moisturiser). So my verdict: If you love foundation that gives you medium coverage and a natural luminous glow, then definitely give this a try. For £11 a bottle, you can’t go wrong! This is a big deal for me, because it takes a lot for me to use anything other than Bobbi Brown Gel Liner (it’s the best!) But when I’m in a rush to get out the door and I’m still half asleep, carefully swirling a brush into the little gel pot is not how I want to spend my time – I want speed. Enter this little gem, which I’d say is Bourjois’ answer to the eyeliner that Benefit recently brought out (their Push-Up Liner) as it is an angled brush. It’s a liquid formula that is like a pen, with the pen tip being angled. It’s great for creating simple eyeliner flicks and cat-eye style makeup and I found it so easy and quick to apply. I apply this with my eyes open so that I can get it very close to my lash line. The angled brush makes it easy to get the desired flick – just simply angle it pointing up to where your brow line ends and press to get a guide line. As it’s liquid, I’d recommend dusting a light loose powder over your eyelids before applying this so you don’t get any smudge or transfer when you apply. This was on my eyes for a good 11 hours before I took it off – and this was on a warm day and when I hadn’t spent a lot of time doing my makeup – so it’s good last and perfect for day-to-day wear. You get an intense black line, so if you like softer, more subtle eyeliner this isn’t for you. Verdict – if you like classic eyeliner flicks and want a liquid liner that’s easy to apply without spending loads, then this product is for you.